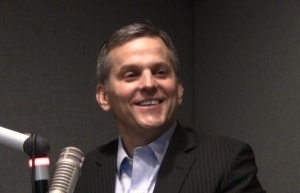 Attorney General Josh Stein and Secretary of State Elaine Marshall met Tuesday without the third member of the Constitutional Amendments Publications Commission, Legislative Services Officer Paul Coble. 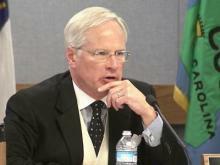 Votes were postponed on ballot caption and description language for six amendments to the state constitution Tuesday when one of the three-member commission’s members didn’t show up to a scheduled meeting. The Constitutional Amendments Publications Commission is tasked with creating short captions for the proposed amendments and longer descriptions of what each amendment would do that will also be available to voters. But all three members—N.C. Attorney General Josh Stein, Secretary of State Elaine Marshall and Legislative Services Officer Paul Coble—must be in attendance for the commission to take a vote on the language. Coble skipped the Tuesday morning meeting, stymying the ability of the commission to craft and vote on language for the ballots or descriptions. The political tug-of-war between Democratic Gov. Roy Cooper and the Republican-controlled General Assembly in the last week has complicated the commission’s work. First, the General Assembly returned in a special session to write its own captions for the ballot, stripping the commission of the ability to do so. Republican leaders said they were afraid the commission would politicize the language. Cooper vetoed the bill that took away the commission’s ability to write the captions. But legislative leaders, with a GOP supermajority, set up a vote Saturday to override Cooper’s latest vetoes. Stein and Marshall, both Democrats, suggested Monday’s scheduled meeting of the commission go forward. If the veto is overridden, they said, the legislature’s caption language would move forward – but the commission is still tasked with preparing longer summaries of a paragraph or two that will be available through local boards of election. 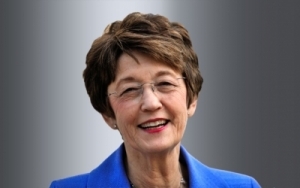 In a Monday e-mail to Stein and Marshall, Coble argued the commission should postpone its meeting until August 6, after the veto override vote. Marshall replied by encouraging Coble to attend Tuesday’s scheduled meeting and offering to postpone discussion of the ballot captions until after Saturday’s vote. The commission could still proceed with the longer descriptions, she wrote. When Coble failed to show for the meeting, Stein and Marshall said they were disappointed. They then turned the meeting into a “work session” on the amendment language. 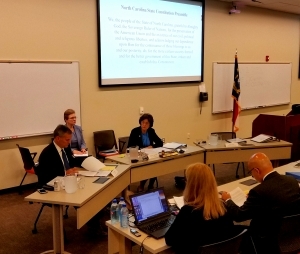 Going through each of the amendments, Stein and Marshall shared concern with how they were written, what they would mean for government in North Carolina and whether voters will actually understand the amendments on which they are being asked to vote. “What I fear is that the voters are going to go in to get a beautiful birthday cake and see this wonderful picture with all this accurate, beautiful description of what it’s going to taste like…and then when they eat it, it’s cat food and they don’t like the taste it leaves in their mouths,” Stein said. Of particular concern, both Stein and Marshall said, are the amendments dealing with filling judicial vacancies and an amendment that would give the legislature broad power to appoint members of boards and commissions. 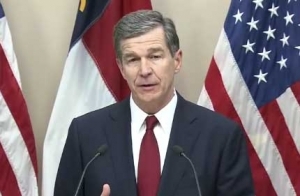 Both are politically controversial issues—the latter of which has been the subject of lawsuits between the last two governors and the General Assembly. The amendment having to do with appointments on boards of commissions seems, at first glance, to deal only with the state board of elections, Marshall said. But when you examine what the amendment would actually do, it is much more expansive. All North Carolina voters elect the Secretary of State, the Attorney General and the Governor, Stein said. But a relatively small number of people can actually vote for those who hold the positions of Speaker of the House and President Pro Tempore of the Senate, the leaders of the legislature. To have the people in those House and Senate positions making decisions about things that are in the responsibility of the executive branch is contrary to the constitution as it has always been understood and harmful to the separation of powers, Stein said. Stein and Marshall recessed the commission until Aug. 6, at a place and time to be determined. After the meeting they said it was disappointing that Coble did not show up to Tuesday’s meeting. Both rejected the idea that the work session—in which they systematically pointed out problems with the wording of the amendments and their potential negative impact on the state—is politicizing the process. “I just want to make sure that when the voter goes to the polls, they know exactly what they’re voting on,” Stein said. Stein admitted that, without the commission writing the captions, voters are not likely to seek out the longer descriptions of the amendment they will devise regardless of the veto override vote. The work is still important though, Stein said. Marshall rejected the idea that going forward with Tuesday’s meeting was politicizing the work of the committee. Coble was given the option to attend the meeting and have the discussion without a vote on the captions, she said. “Him not showing today is an act of politicization of this,” Marshall said. Previous PostConstitution Party files federal lawsuit after members stripped of election ballot accessNext Post African American infants now die at more than 2.5 times the rate of white infants in N.C.